We are proud to announce that Wallis Ranch Owners Association has selected Tinnelly Law Group as their associations’ legal counsel. 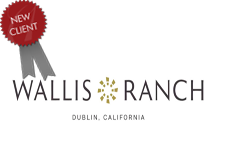 Wallis Ranch is a gated master planned community of 800 new homes in 8 distinctive neighborhoods in Dublin. Recognized by Builder and Developer Magazine as the “2016 Community of the Year,” over half of its 184 acres has been dedicated to parks, open space and a water-quality basin. Residents enjoy an edible garden, fitness center, pool, spa, and a mile of trail systems. Our HOA attorneys and staff look forward to working with Wallis Ranch’s Board and management.